Professor Michelle Simmons is Director of the ARC Centre of Excellence for Quantum Computation and Communication Technology Centre, based at the University of New South Wales awarded 2015 CSIRO Eureka Prize for Leadership in Science for Leading Australia’s quantum future. Australia’s position at the forefront of the developing field of quantum computing is at least partly due to the leadership shown by Professor Michelle Simmons. Professor Simmons is Director of the ARC Centre of Excellence for Quantum Computation and Communication Technology Centre, based at the University of New South Wales. Developed the world’s smallest transistor, built of one single atom. Built the world’s smallest silicon wires, a thousand times narrower than a human hair. Independently controlled quantum components only a few millionths of a millimetre apart. For her leadership, passion, commitment and energy devoted to advancing the field of quantum computing in Australia, Professor Simmons has been awarded the CSIRO Eureka Prize for Leadership in Science. “The 180 researchers of the Quantum Computation and Communication Technology Centre, which Professor Simmons established and leads, are ensuring Australia’s success in what will become a multi-billion dollar industry,” Kim McKay AO, Executive Director and CEO of the Australian Museum said. “Their success is a tribute to Professor Simmons’ demonstrated passion, commitment and energy,” she said. One of the youngest and one of the first female physicists elected as a Fellow of the Australian Academy of Science (2006). An Australian Research Council Laureate Fellow (2013). One of very few researchers to have won two Australian Research Council Federation Fellowships (2003 and 2008). A Foreign Honorary Member of the American Academy of Arts and Sciences (2014). Established in 1827, the Australian Museum is the nation’s first museum and one of its foremost scientific research, educational and cultural institutions. The Australian Museum Eureka Prizes are the most comprehensive national science awards, honouring excellence in Research and Innovation, Leadership, Science Communication and Journalism, and School Science. Professor Snow Barlow (University of Melbourne) for policy and research leadership in the field of climate change. Rosie Hicks (Australian National Fabrication Facility), for leading national collaboration in Australia’s scientific infrastructure. D-Wave Systems Inc., the world's first quantum computing company, today announced the general availability of the D-Wave 2X™ quantum computing system. The D-Wave 2X features a 1000+ qubit quantum processor and numerous design improvements that result in larger problem sizes, faster performance and higher precision. At 1000+ qubits, the D-Wave 2X quantum processor evaluates all 21000 possible solutions simultaneously as it converges on optimal or near optimal solutions, more possibilities than there are particles in the observable universe. No conventional computer of any kind could represent this many possibilities simultaneously, further illustrating the powerful nature of quantum computation. The D-Wave 2X demonstrates a factor of up to 15x gains over highly specialized classical solvers in nearly all classes of problems examined. Measuring only the native computation time of the D-Wave 2X quantum processor shows performance advantages of up to 600x over these same solvers. To showcase the performance of the new system, a paper outlining benchmark results for a set of problems native to the D-Wave 2X system will be posted to the arXiv. A summary of the results and a link to the paper are on the company’s blog. The benchmark includes a set of synthetic discrete combinatorial optimization problems intended to be representative of real world challenges. Some application challenges currently under study at D-Wave involve algorithms that tune stock portfolios or underlie machine learning used in bioinformatics, inductive logic programming, and natural language processing and computer vision. In addition to scaling beyond 1000 qubits, the new system incorporates other major technological and scientific advancements. These include an operating temperature below 15 millikelvin, near absolute zero and 180 times colder than interstellar space. With over 128,000 Josephson tunnel junctions, the new processors are believed to be the most complex superconductor integrated circuits ever successfully used in production systems. Increased control circuitry precision and a 50% reduction in noise also contribute to faster performance and enhanced reliability. The D-Wave 2X system is available immediately for shipment and installation. D-Wave Systems is the first quantum computing company. Its mission is to integrate new discoveries in physics, engineering, manufacturing, and computer science into breakthrough approaches to computation to help solve some of the world’s most complex challenges. The company's quantum computers are built using a novel type of superconducting processor that uses quantum mechanics to massively accelerate computation. D-Wave’s customers include some of the world’s most prominent organizations including Lockheed Martin, Google and NASA. With headquarters near Vancouver, Canada, D-Wave U.S. is based in Palo Alto, California. D-Wave has a blue-chip investor base including Bezos Expeditions, BDC Capital, DFJ, Goldman Sachs, Growthworks, Harris & Harris Group, In-Q-Tel, International Investment and Underwriting, and Kensington Partners Limited. For more information, visit: www.dwavesys.com. Physicists from the University of Vienna and the Austrian Academy of Sciences have demonstrated a new quantum computation scheme in which operations occur without a well-defined order. A team of physicists from the University of Vienna and the Austrian Academy of Sciences have demonstrated a new quantum computation scheme in which operations occur without a well-defined order. The researchers led by Philip Walther and Caslav Brukner used this effect to accomplish a task more efficiently than a standard quantum computer. Moreover, these ideas could set the basis for a new form of quantum computing, potentially providing quantum computers with an even larger computational speed-up. Their results will be published in an upcoming issue of "Nature Communications". Since its conception, quantum mechanics has defied our natural way of thinking, and it has forced physicists to come to grips with peculiar ideas. Although they may be difficult to digest, quantum phenomena are real. What’s more, in the last decades, scientists have shown that these bizarre quantum effects can be used for many astonishingly powerful applications: from ultra-secure communication to hacking existing secure communications, and from simulating complex quantum systems to efficiently solving large systems of equations. One of the most exciting and most difficult proposed quantum technologies is the quantum computer. Quantum logic gates are the basic building blocks of a quantum computer, but constructing enough of them to perform a useful computation is difficult. In the usual approach to quantum computing, quantum gates are applied in a specific order, one gate before another. But it was recently realized that quantum mechanics permits one to "superimpose quantum gates". If engineered correctly, this means that a set of quantum gates can act in all possible orders at the same time. Surprisingly, this effect can be used to reduce the total number of gates required for certain quantum computations. A team led by Philip Walther recently realized that superimposing the order of quantum gates, an idea which was theoretically designed by the group of Caslav Brukner, director of the Institute for Quantum Optics and Quantum Information - Vienna, could be implemented in the laboratory. In a superposition of quantum gate orders, it is impossible – even in principle – to know if one operation occurred before another operation, or the other way around. This means that two quantum logic gates A and B can be applied in both orders at the same time. In other words, gate A acts before B and B acts before A. The physicists from Philip Walther’s group designed an experiment in which the two quantum logic gates were applied to single photons in both orders. The results of their experiment confirm that it is impossible to determine which gate acted first – but the experiment was not simply a curiosity. "In fact, we were able to run a quantum algorithm to characterize the gates more efficiently than any previously known algorithm," says Lorenzo Procopio, lead author of the study. From a single measurement on the photon, they probed a specific property of the two quantum gates thereby confirming that the gates were applied in both orders at once. As more gates are added to the task, the new method becomes even more efficient compared to previous techniques. This is the first time that a superposition of quantum gates has been implemented in the lab. At the same time, it was used to successfully demonstrate a new kind of quantum computing. The scientists were able to accomplish a computation with an efficiency that cannot be achieved within the old scheme of quantum computing. This work opens a door for future studies on novel types of quantum computation. Although its full implications are still unknown, this work represents a new, exciting way to connect theoretical research on the foundations of physics to experimental quantum computing. "Experimental Superposition of Orders of Quantum Gates"
On August 20th, 2015, world-renowned quantum physicist Rainer Blatt will be awarded a prestigious prize for his contributions to the development of quantum information technologies, during the Conference on Quantum Information and Quantum Control being held at the Fields Institute at the University of Toronto. The fourth biennial John Stewart Bell Prize for Research on Fundamental Issues in Quantum Mechanics and Their Applications, administered by U of T's Centre for Quantum Information & Quantum Control, has been awarded to Professor Blatt, of the University of Innsbruck, by an arms'-length selection committee of international experts, "for his pioneering research on quantum information processing with trapped ions, in particular, for the recent demonstrations of analog and digital quantum simulators and quantum logic gates on a topologically encoded qubit." A computer that exploits the strange features of quantum theory is extraordinarily more powerful than any silicon-based computer. This discovery of the mid 1990's triggered a race to develop so-called quantum computers. One of the most promising technologies for quantum computation is trapped ions (i.e. charged atoms). Professor Blatt is a pioneer and leader in this technology. GENEVA—August 5, 2015—1QBit, the world’s first quantum computing software company, was awarded today as one of the World Economic Forum’s “technology pioneers”, a selection of the world’s most innovative companies. 1QBit was founded by Andrew Fursman and Landon Downs in Vancouver, Canada and is supported by a strong network of investors including the Chicago Mercantile Exchange, D-Wave Systems, and the Royal Bank of Scotland. The organization is dedicated to connecting the power of quantum computation to real-world industry applications. 1QBit was chosen by a professional jury among hundreds of candidates as one of the 49 selected companies. Thanks to this selection, 1QBit will have access to the most influential and sought-after business and political network in the world, and be invited to the World Economic Forum’s “Summer Davos” in Dalian, China this September, and the January Annual Meeting in Davos. As in previous years, American-based entrepreneurs continue to dominate the list of technology pioneers: they account for more than two-thirds of the recipients, followed by the United Kingdom (4), Israel and the Netherlands (2), and individual recipients from Canada, Germany, Ireland, Italy, Sweden, and Taiwan. The Technology Pioneers were selected from among hundreds of applicants by a selection committee of 68 academics, entrepreneurs, venture capitalists, and corporate executives. Notable members of the committee include Arianna Huffington (founder, Huffington Post) and Henry Blodget (editor-in-chief, Business Insider). The committee based its decisions on criteria including innovation, potential impact, working prototype, viability, and leadership. Past recipients include Google (2001), Wikimedia (2007), Mozilla (2007), Kickstarter (2011), and Dropbox More information on past winners can be found here. 1QBit explores new ways to tackle the most difficult computational problems, then applies those techniques to solve real-world challenges by creating software for quantum processors. For more information, visit www.1qbit.com. Researchers in the University of Tokyo have demonstrated that it is possible to exchange a quantum bit, the minimum unit of information used by quantum computers, between a superconducting quantum-bit circuit and a quantum in a magnet called a magnon. This result is expected to contribute to the development of quantum interfaces and quantum repeaters. Illustration of magnet-qubit coupled system A magnet (ytterium iron garnet; YIG) and a superconducting qubit are placed with a separation of 4 cm. The electric field in the cavity interacts with the qubit, while the magnetic field interacts with the magnet. At an extremely low temperature of around -273 degrees centigrade, magnons, i.e., quanta of the fluctuations in the magnet, coherently couple with the qubit through the electromagnetic field of the cavity. Magnets, often used in our daily life, exert a magnetic force produced by a large number of microscopic magnets – the spins of individual electrons – that are aligned in the same orientation. The collective motions of the ensemble of spins are called spin waves. A magnon is a quantum of such excitations, similar to a photon as a quantum of light, i.e., the electromagnetic wave. At room temperature the motions of electron spins can be largely affected by heat. The properties of individual magnons have not been studied at low temperatures corresponding to the “quantum limit” where all thermally-induced spin fluctuations vanish. The research group of Professor Yasunobu Nakamura at the University of Tokyo Research Center for Advanced Science and Technology has succeeded for the first time to couple a magnon in a magnet to a photon in a microwave cavity at an ultralow temperature near absolute zero (-273.14 degrees centigrade). They observed coherent interaction between a magnon and a microwave photon by placing a millimeter-sized ferromagnetic sphere made of yttrium iron garnet in a centimeter-scale microwave cavity. The research group furthermore demonstrated coherent coupling of a magnon to a superconducting quantum-bit circuit. The latter is known as a well-controllable quantum system and as one of the most promising building blocks for quantum processors. 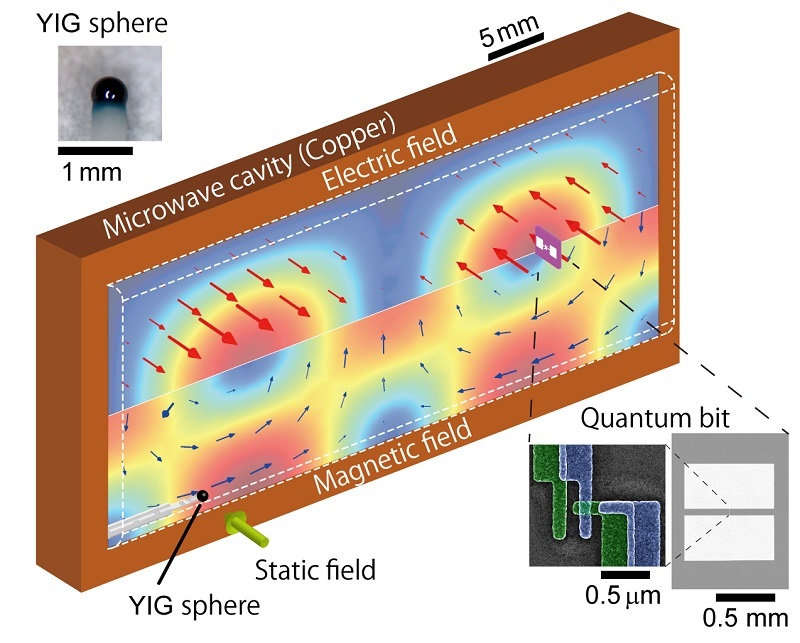 The group placed the magnet together with the superconducting qubit in a cavity and demonstrated exchange of information between the magnon and superconducting qubit mediated by the microwave cavity. The results will stimulate research on the quantum behavior of magnons in spintronics devices and open a path toward realization of quantum interfaces and quantum repeaters. Yutaka Tabuchi, Seiichiro Ishino, Atsushi Noguchi, Toyofumi Ishikawa, Rekishu Yamazaki, Koji Usami, Yasunobu Nakamura, "Coherent coupling between a ferromagnetic magnon and a superconducting qubit", Science Online Edition: 2015/7/10 (Japan time), doi: 10.1126/science.aaa3693.